David Cameron has announced the UK’s terror threat level has been raised from “substantial” to “severe” in response to an attack on him by militants at an Age UK conference earlier today. The new alert level rates the risk of an attack by OAPs on the UK PM “highly likely”, although the Home Secretary Theresa May said there was no evidence to suggest another ambush on Mr Cameron by pensioners was “imminent”. In a tough response to the attacks, Mr Cameron said he was determined to clamp down on what he called a “dangerous radicalisation of our old people” and promised new legislation which would make it easier for security forces to take bus passes and walking sticks away from those OAPs who may be planning further attacks on him or any other government ministers. The crackdown on militant pensioners comes just weeks after the Ministry of Defence ordered air strikes against radical OAP strongholds in bingo halls and bowling greens in a fresh drive to defeat homegrown pensioner extremism. Some of us can still remember when the WI heckled Blair when he spoke to them, rather than be overwhelmed by the majesty of oratory. Cameron seems to have had the same experience here, and the Tory party can’t get over the fact that the proles aren’t falling over themselves with gratitude. It looks like Britain’s mature gentlefolk are one part of the population, who aren’t going to give smarmy politicos with nasty ideas on how to treat the poor, the disabled and the elderly an easy time. 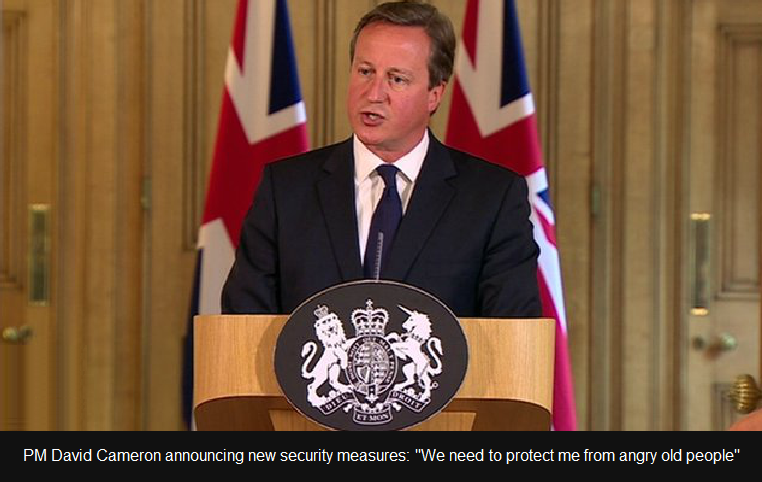 I nearly pee’d myself laughing at Cameron – he really hasn’t got a clue, has he? No, absolutely not. He really does believe he has an absolute right to right, and thinks of himself as the true heir of Maggie Thatcher. she also said she’d go and on and on. And she did, right up till the moment the rest of the party decided she was a liability and given the heave-ho. Cameron is serious about redefining terrorism to mean anything left wing and anti establishment but he’s not going to catch me out. I’ve got a cunning plan. Attack continued on our beloved ToryParty on BBC 3 “Free Speech” Programme despite valiant attempts by Toby Young and Lisa Zissman to correct the Extremist Young Audience. I had the temerity to be early retired in lieu of redundancy from the massive austerity job cuts reaching 1 million and will hit a further million, on a public sector works pension that the Institute of Fiscal Studies calls 4 per cent lowest income. This is, indeed the average public sector pension to the vast majority who were low waged, the bulk of the staffing. re-assessment from DLA to PIP and then total loss even to the Blue Badge disabled parking badge, chronic sick benefit losses, council tax benefit losses, housing benefit losses, and the coming permanent sanctions under Universal Credit from Hardship Payments becoming recoverable loans by court action for direct deductions from future benefit or wages. There are 1 million 60-64 only on some kind of welfare. The over 60s are not listed in government unemployment figures. Half of over 60s are within the working poor. Of the 11 million disabled, are 40 per cent of the over 50s. From 2016 we will see the start of totally penniless starving pensioners, even more than today. By 2020 the council grant will have reduced from around £14 billion in 2010 down to a mere about £2 billion by 2020. And Barnet Tory council seems the first entirely privatised council, and has evicted an entire social housing estate, having sold it to a developer to build luxury flats. Think on that when folk say the old are better off than the young. The Institute of Fiscal Studies say the 1950s Baby Boomers today are worse off, since the 1950s, than their parents and grandparents, even from a decade ago. I am beginning to think that, in fact, about 75 per cent of the UK population are now poor. It’s worrying that the threat has gone from Amber to Grey. I’m an ex serviceman that would be happy to come out of retirement to protect our PM. By this time next week Age Concern will be a proscribed organisation, deemed to have been giving hate speech and spreading false news and conspiracy theories. Does Age concern get any funding from Central Covernment? If so watch its funding get cut, letters of “you’re being political” etc. sent, and a slew of DM articles showing how its run by a bunch of left-eye labour supporters who have infiltrated it. I revel in my disadvantaged status being male, white, over sixty but not of pension age, married, a home owner, just enough money to qualify for no benefits and Scottish. Despite this I find myself content to live, some of the time, in Thatcher’s Britain. What’s that you say, she’s been replaced, well I never would have noticed the difference, who by, that Milliband fellow? Doesn’t looks like it, Jonathan? jim cross , ‘extremist young audience’ on ‘free speech’ program , so anyone with a view that is not ‘conservative’ is an extremist ? dear me the quicker we get independence the better . you all seem quite content for mps to fiddle expenses and cover up the wrong doings by other mp’s but god forbid someone questions the establishment !